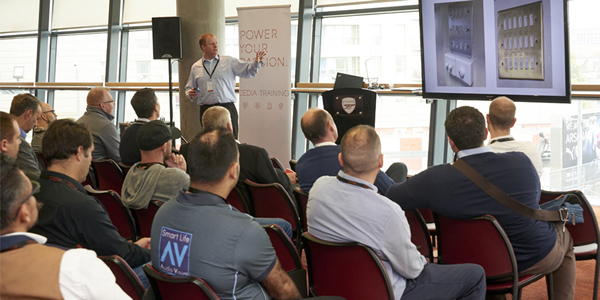 CEDIA began its Tech Summit tour at Lord’s Cricket Ground in London on Thursday 4th April. This free to attend event promoted real-world education, practical business development, and networking for all involved. The London Tech Summit featured four, 45-minute presentations, with trade supplier members focussing on key categories, including audio, video, lighting, and security. While CIE provided a comprehensive guide to specifying and installing high-quality intercom solutions as part of a fully-integrated smart building solution or MDU project, Focal took an in-depth look at the ever-expanding home cinema market, focussing on key areas such as maximising performance, subwoofer placement, the importance of phase coherency, and an introduction to Dirac Live. After lunch, Blustream UK answered the question of whether it is worth investing in 8K displays by looking at the newly formed HDMI 2.1 specification, and Rako Controls discussed how dimming technology has changed over the last ten years, and covered the different types of LED lighting used in residential projects. Between sessions, visitors had the opportunity to meet all sponsors and explore what products and solutions they have to offer. This year’s sponsors included Alltrade, Amina, AWE, Blustream UK, CIE, Control4, Crisp Accountancy, Focal, Future Automation, Gallo Acoustics, GJD, Invision, KEF, LG, LILIN, Lithe Audio, Lutron, Meridian Audio, My KNX Store, OneAV, and Rako Controls. Following a day of education and valuable one-to-one time with the manufacturers and distributors, CEDIA hosted a networking drinks reception. Tech Summits will also take place in Wetherby, West Yorkshire on 11 June 2019 and in Edinburgh, Scotland on 2 October 2019.